As a clock collector, any Seth Thomas clock catches my eye. They are all well made quality clocks, and are rapidly increasing in value. The story of the Seth Thomas Clock Company is indeed an American success story. 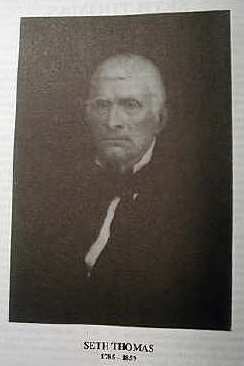 Seth Thomas was born August 19, 1785 in Wolcott, Connecticut. This area of western Connecticut was a busy center for the manufacture of wooden clockworks at the time Seth Thomas was growing up, so it is no surprise that he would work in this industry as a young man. He was apprenticed to a joiner, Daniel Tuttle, at the age of 14. After finishing his training, he bought 42 acres of land in Wolcott, intending to settle there. He was hired by Eli Terry in 1806, at the age of 21, along with another local woodworker, Silas Hoadley, to work in his new clock shop in Plymouth, Connecticut. 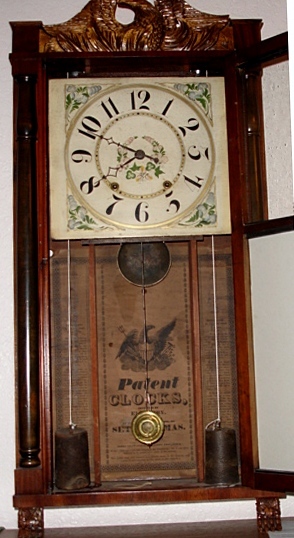 Eli Terry, only in his mid-thirties at the time, had agreed to make 4000 wooden clock movements (see photo above) for Edward Porter and Levi Porter of Waterbury, Connecticut. Thomas and Hoadley were hired to help Terry meet this deadline. After fulfilling this agreement, Terry sold the clock shop to Thomas and Hoadley for $6000 on July 7, 1810. Three years later on December 4, 1813, Thomas sold out to Hoadley for $2000 and purchased another clock factory from Herman Clark. Thomas continued to make wooden movement tall clocks in his new factory, the same as he did with Hoadley at the Thomas and Hoadley factory. This new factory was only a couple of miles away from Eli Terry’s new clock factory. Around 1818, Thomas began making Terry’s wooden movement pillar and scroll clocks, paying a $.50 royalty to Terry for each clock made. In 1822, Terry accepted $1000 in lieu of the aforementioned royalty. For reasons unknown, Thomas began making Terry’s ’new improved’ shelf clock which caused Terry to sue Thomas in 1827; although no financial award was given to Terry. The lawsuit did keep other clockmakers in the area from infringing on Terry’ patent for a few years though. 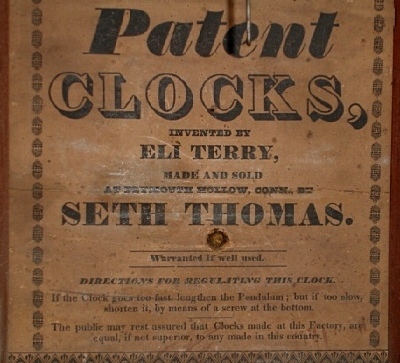 Seth Thomas was a good businessman and managed to build a solid and profitable company that turned out many quality clocks. He also had the good financial sense to diversify his holdings. He started a cotton factory in 1834 and purchased a considerable amount of land. This helped him survive through the panic of 1837 that forced many of his clock making competitors out of business. Although he was a good businessman, Thomas was not on the cutting edge of clock development. Nor did his company come out with any new case designs or radically new movement designs. Rather, he would keep producing his proven clocks that had always been successful in the past. Only when the new, cheap brass movements became so popular that Thomas was at risk of losing his customers, did he finally change his method of production. By 1844, Thomas saw that the new brass movement, introduced by Nobel Jerome, was going to end the wooden movement clocks, so he sent his nephew, Marcus Prince, to the Jerome factory to learn the new trade. The brass clocks turned out to be very profitable for Thomas. By 1850, he was turning out 24,000 clocks annually that were valued at $60,000. The factory employed about 50 men and no women at the time. 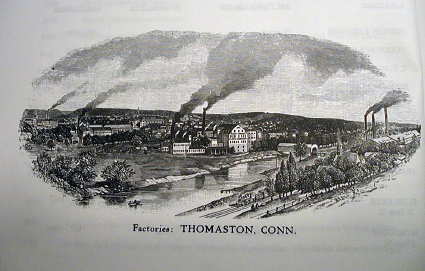 In 1852, Thomas built a brass-rolling mill which was incorporated as the Thomas Manufacturing Company. By 1860, it was producing over 170 tons of brass and German silver annually. The mill was sold on May 21, 1869 to Holmes, Booth and Atwood Manufacturing Company of Waterbury, Connecticut for $400,000. On May 3, 1853, when Thomas was 63 years old, he finally organized the Seth Thomas Clock Company as a joint stock corporation. He knew he would not live forever and wanted to insure the continuation of his company after his death. Thomas remained as president and major stockholder until his death on January 28, 1859. He was 73. Thomas was a very wealthy man when he died. The townspeople of Plymouth Hollow, where his factory was located, also respected him for providing the businesses that were essential for the town’s growth. Six years after his death, in 1865, they unofficially renamed the town ’Thomaston’ in his honor. This is one way of dating early Seth Thomas clocks that still have legible labels. If the label reads ’Plymouth Hollow’ (see picture above), it is pre 1865. If it reads ’Thomaston’ it is post 1865. The name Thomaston was incorporated and made official on July 6, 1875. The name change on the company’s label was made shortly after 1865. After Seth’s passing the Seth Thomas Clock Company was run by his three sons, Aaron, Edward, and Seth, Jr. Business kept expanding as well as the number of clock types offered with the more forward thinking sons at the helm. Calendar clocks were also added to the growing line of clocks. On October 17, 1865, a new company known as Seth Thomas’ Sons & Company was formed for manufacturing marine, lever escapement movements and some high-grade pendulum clocks with porcelain dials. These latter clocks were to compete with the highly popular French clocks of the time. This new firm was eventually consolidated with the Seth Thomas Clock Company on January 31, 1879. In 1872, The Seth Thomas Clock Company purchased the business of Andrew S. Hotchkiss that manufactured tower and street clocks ( see an example here). Hotchkiss remained as an employee of the Thomas Company to oversee their installations of tower and street clocks. 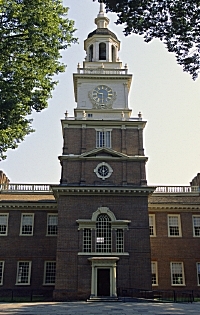 One of the Seth Thomas Clock Company’s largest clocks was built for Independence Hall in Philadelphia in 1876 for the country’s Centennial celebration (this tower clock can be seen on the back of a 100 dollar bill). The company received many awards and honors for their tower and street clocks and continued making them well into the twentieth century (the last one was installed in Lebanon, Connecticut on November 5, 1942). In 1880, the company claimed $500,000 in capital investment and was producing $729,000 worth of clocks annually. Employment was 640 men, 123 women, and 71 children. They worked a ten hour day for $3.00 skilled, and $1.50 unskilled labor. In 1882 the company was the first in Connecticut to enter into the jeweled pocket watch business. A four-story addition was added to the marine movement shop for their production. The first watches were ready for market in 1884. They made about 18 different models, each in four grades. By 1900, the jeweled pocket watch business was slowing due to the flooding of the market by the many companies producing essentially the same type watch. Also, the price was too high for the majority of Americans to pay. To help prop up sales, the company started making cheaper, 7-jewel, nickel cased watches which were priced below the high-grade jeweled watches made by their competitors. The lower price was still significantly higher than the very popular non-jeweled ’dollar watches’ that were affordable by the majority of Americans and kept reasonable time. In 1915, the company decided that the small profit that they were making for this narrow market was not worth the bother. Plus, after making millions of pocket watches, the manufacturing equipment was in need of replacement, so watch production ceased. The Seth Thomas Clock Company continued to strive for excellence in clock making as it neared the end of the eighteenth century. They introduced many regulator clocks; some with mercury pendulums, and one high-grade precision clock in 1888 that was made for observatory use (this latter was offered until 1913). Most of these fine regulators, offered until about 1910, were not only very accurate timekeepers, but were housed in beautiful, solid hardwood cases. Any of these regulators are highly sought after by collectors and bring high prices, even in fair to poor condition! Also in 1888, the company began making 8-day, weight-driven tall clocks, the first made by the firm since 1820 when Seth Thomas was still making the wooden movement tall clocks. By 1902, 26 models were available, most of which were dropped by 1911. These tall clocks are also very collectible and in high demand. If lucky enough to find one in good condition, expect to pay thousands of dollars for it. In 1884, the ’ships bell’ clock was added to the already popular brass and nickel marine clock. In that same year, the walnut-cased kitchen clock was also introduced, some equipped as alarm clocks. The now famous ’Adamantine’ finished clocks were added to the catalog in 1885 with many styles and colors to choose from. Originally made to replace the previously popular ’black mantel’ iron or wood clock, the adamantine clocks were made until 1917. Also between 1900 and 1917, many styles of small ‘crystal regulators’ were made with brass cases and beveled glass front and sides. Some also had mercury pendulums. 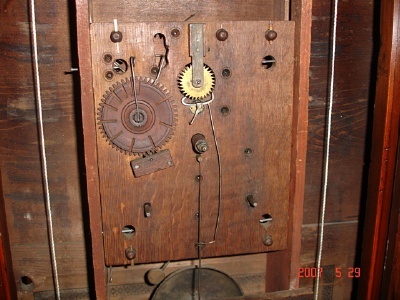 The Sonora chiming clocks were introduced in 1909. The popular Simon Willard style ’banjo’ clock was added in 1924, and synchronous electric clocks in 1928. On January 31, 1931, the Seth Thomas Clock Company became a division of General Time Instruments Corporation, later known as General Time Corporation. Seth E. Thomas, the great-grandson of Seth Thomas remained as chairman of the board until his death on June 5, 1932. This was the first time in over 120 years that the company was not run by the Thomas Family. The factory continued to manufacture Seth Thomas clocks until after WWII when General Time decided to start buying movements from foreign countries (many from Germany) and some domestic companies for their clocks rather than manufacture them in-house. These clocks, still with the Seth Thomas Clock Company name, were assembled in the factory in Thomaston, Connecticut. In 1955, the Thomaston plant was closed due to severe flood damage. One year later, in 1956, General Time decided to reopen the factory. They assembled Seth Thomas Clocks, with purchased movements, and now outsourced cases, thereby keeping the famous brand name alive. In 1970, the Seth Thomas Clock Company, along with General Times Westclox brand were taken over by Talley Industries of Seattle, Washington. The next big change made to the company, in 1982, was to close the Thomaston plant and move all operations to Norcross, Georgia. Both labor and taxes were much less expensive there. In 2001, the assembly plant started laying off workers and reducing production. The company was sold to the Colibri Group, a British company that manufactures the famous Colibri cigarette lighters, so the longest surviving clock company in America was saved. You can still buy a new Seth Thomas clock today. You don't have to wait to add a great Seth Thomas to your collection; nor do you have to waste gas and time driving around hoping to find one. Ebay always has a fine collection. Thats where I found most of my best ones. New to eBay? It's easy to register and only takes a few minutes. A good friend of mine is an eBay power seller and almost always has several great antique clocks for sale. All of his clocks are guaranteed to work (I know because I do a lot of his clock repair work). Bryon and his wife Donna are incredibly busy all the time making sure their customers are 100% satisfied. Check out the box below to see what they have available right now.